What makes a good "developer experience"? We are all quite familiar with the term "user experience" (UX) because as developers, we are typically spending our time developing products that we want people to use, and we want the UX to be positive so that they continue using them. However, we are now in the age of web APIs and developer platforms, and increasingly more of us are spending our time developing products for developers themselves to use. 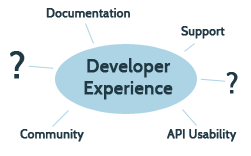 Just like with user products, we want the "developer experience" (DX) to be positive so they continue developing on top of our service, and so they feel good relying on us to be part of their app's technology stack. When we talk about user experience, we focus on the usability of the user interface and the various user actions (like sign-in, search, share). A developer experience is very different, though, and when we talk about it, we should be focusing on the usability of the API and the developing-and-debugging experience. How does a developer first learn about your service? Where do they go when they need help? How easy is it for them to develop arbitrary apps on top of it? Can they use it successfully in their preferred environment? Those are the sort of questions that we need to ask to figure out what the developer experience is like. Developer experience is important and non-trivial, but unfortunately, it's been nowhere near as discussed as user experience - a quick Google search yielded mostly this one article from UXMag. When I worked in developer relations at Google, we were basically tasked with designing the DX for our APIs and tools, and when I wrote up the Developer Support Handbook, I was attempting to document some of what I learnt from my years on the Maps and Wave APIs. That handbook only talks about some aspects of the experience - it doesn't talk about API usability at all - and it's only based on my own limited experience. I know that there is much more to be documented and discussed, and that there are many different types of developers and developer services out there, and just as with UX, there may not be just one set of DX principles that fits everything. Why do I bring this up? A few weeks ago, I met with a mobile analytics company called Flurry to discuss their developer experience and how they can improve it to better support their current developers and encourage future developers. I gave them my own opinions, but I really would love to hear the opinions of more developers to give me a broader perspective. To find out what you guys think about what makes a positive developer experience, I've put together a short survey. Please fill it out if you have the time, or feel free to leave comments on this post. Thank you for your thoughts and for caring about what it means to have a good developer experience.